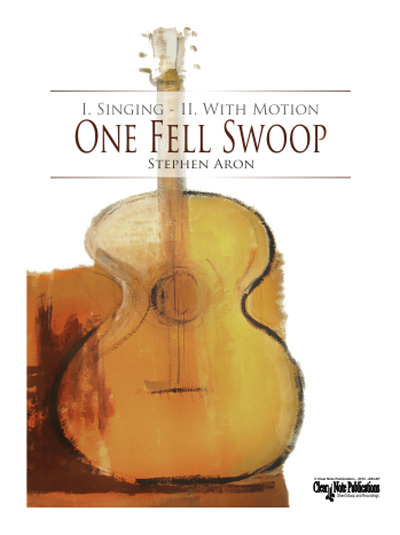 One Fell Swoop is a solo work written in a style informed by both Romantic-period phrasing and melodic shapes and modern post-tonal harmonic language. Its texture is rich and full, almost pianistic. The particular melodic and harmonic material of the piece is inspired by an unusual tuning: 6th string to F natural and 4th string to C sharp. The first movement, "Singing" incorporates a steady 3-against-4 rhythm to underpin a sweeping Romantic-style melody. This material is contrasted by a brisk central section which introduces the primary motive over an unusual arpeggiated accompaniment, before returning to the earlier melodic theme. The second movement, "With Motion" begins with a heroic gesture, a fast, exotic scale, then reintroduces the primary motive for a series of statements, each one with a different contrapuntal accompaniment. This texture is interrupted by a slow and plaintive melody which is developed over the course of five statements until it erupts into a return of the movement's opening gesture. The work ends in a flurry of cascading and harmonically surprising arpeggii and a virtuoso cadenza.